NEW YORK, NY, Oct 24, 2018: Key Medium Founder Ali Jaffar and Creative Director Erkan Salhi were honored as 2018 Silver Davey Awards winner for developing a standout brand experience – for a nonprofit college that provides vocational programs for High Priority Occupations in North Philadelphia. The Workforce Institute’s City College sought Jaffar’s expertise in creating successful digital experiences through digital agency Key Medium to radically rethink their website and brand. Due to its dramatic overhaul in development, design, branding, and messaging, WFICityCollege.org received its second award – a Silver in the Websites – School/University category. Since launch, the site has generated an unprecedented amount of traffic, engagement, and buzz. WFI City College is a recipient of Key Medium’s Coding For Causes program, which offers discounted web and digital strategy services to nonprofit organizations. If your organization is in need of a digital makeover, apply for a Coding For Causes Grant. Your nonprofit may be eligible to receive a new website created by the award-winning team at Key Medium. Founded in 2014, Key Medium is a premiere digital agency that creates beautiful, branded experiences for businesses, nonprofits, and government agencies. Key Medium has received praise for spearheading the growth of startup companies and lending affordable expertise and services to Philadelphia charter schools and nonprofit organizations. At Key Medium, giving back is in our company’s DNA. We dedicate a portion of our time and resources to create digital experiences for awesome causes. We’re currently offering a 2019 Key Medium Coding For Causes Grant for nonprofit organizations in the community development and education space. Applying is easy. Email codingforcauses@keymedium.com and tell us your story. The Davey Awards is an international creative award focused exclusively on honoring outstanding creative work from the best small shops worldwide. The 14th Annual Davey Awards received 3,000 entries from ad agencies, interactive agencies, production firms, inhouse creative professionals, graphic designers, design firms and public relations firms. David defeated the mighty Goliath with a big idea and a little rock. That is the sort of thing small agencies do every day. 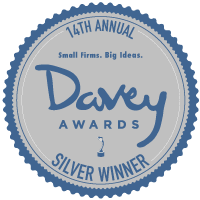 The Davey Awards honors the achievement of the “Creative David’s” where strength comes from ideas, intelligence and out -of-the-box thinking, not a “Giant’s” bankroll. Great work is about fresh ideas and exceptional execution, not the biggest budgets. The Davey levels the playing field so entrants compete with only their peers and can win the recognition they deserve. The Davey is judged and overseen by the Academy of Interactive and Visual Arts (AIVA). The AIVA is an invitation-only member-based organization of leading professionals from various disciplines of the visual arts dedicated to embracing progress and the evolving nature of traditional and interactive media. Current membership represents a “Who’s Who” of acclaimed media, advertising, and marketing firms including: Code and Theory, Condé Nast, Disney, GE, Johns Hopkins Medicine, Microsoft, Tinder, MTV, Push., Publicis, Sesame Workshops, The Marketing Store, Worktank and Yahoo!, and many others. Visit www.aiva.org for more information.